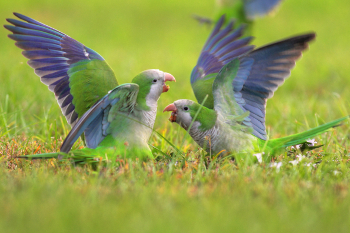 KNOXVILLE—A study of aggression in monk parakeets suggests that where they stand in the pecking order is a function of the bird's carefully calibrated perceptions of the rank of their fellow-feathered friends. But how do the birds infer rank - their own and the rank of those in the rest of the flock - and then act upon it? "Parakeets appear to be able to connect the dots in their groups, remembering chains of aggression, so if A fights B, then watches how B fights C and how C fights D and how D fights E, then A will use this knowledge to adjust how it interacts with E based on all of the fights in between," said the study's lead author Elizabeth Hobson, a postdoctoral fellow at the National Institute for Mathematical and Biological Synthesis. Unlike other animals that might use visual cues, such as size, or perceptional clues, such as spatial location, to determine rank, the monk parakeet appears to rely on other clues - ones that are based on newly acquired social knowledge, the study found. "We looked for cases where we could clearly determine a winner when aggression took place - often these were cases where a bird approached another and knocked it off its perch. It's pretty easy to determine the winner in these kinds of events," Hobson said. "Our approach provides insight not only into how these parakeets are behaving in their groups, but also into the cognitive skills they would need to exhibit these kinds of strategic behaviors. This allows us to start to understand the interaction between social and cognitive complexity and to begin to compare what we see in the parakeet groups to other socially complex species like primates," Hobson added.